The Pacific Fleet Submarine Memorial Association awards the USS Bowfin Memorial Scholarships every year to submariners who are stationed in Hawaii and their immediate family members (spouse and children). Scholarships are also available for retired submarine Sailors and their immediate family members (spouse and children) living in Hawaii. This scholarship program was started in 1985 and over the years over $900,000 has been awarded to hundreds of submariners and their families. There are currently ten named scholarships named in honor of individuals who made significant contributions to USS Bowfin Submarine Museum & Park. Short biographies of these individuals are provided below. For the 2019-2020 academic year the Pacific Fleet Submarine Memorial Association Board of Directors is proud to announce that up to $100,000 has been made available to support this scholarship effort. Current Bowfin Memorial Scholarship recipients are eligible to renew their scholarships even if their sponsor has been transferred from Hawaii, but you must apply to renew your scholarships. Commencing with the 2019-2020 academic year, the Pacific Fleet Submarine Memorial Association has partnered with the Hawaii Community Foundation (HCF) to administer the Bowfin Memorial Scholarship Program. Applicants will complete an online Common Application process via the HCF website (link below) and will be automatically screened for eligibility for over 200 other scholarship programs administered by the Hawaii Community Foundation. For questions related to the Bowfin Memorial Scholarship program, please contact Mrs. Lana Vargas at 808-423-1341. For questions pertaining to the online application process, please contact the HCF Scholarship hotline at (808) 566-5570, or by email at scholarships@hcf-hawaii.org. ADMIRAL Bernard “Chick” Clarey entered the Naval Academy in 1930 where he commissioned as an Ensign on 31 May 1934. 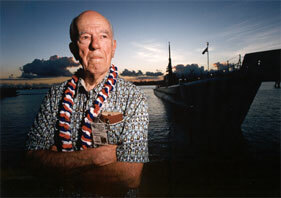 Admiral Clarey was Executive Officer on board the USS Dolphin (SS-169) when Pearl Harbor was attacked. He continued to serve on various submarines during WWII, and he retired as a 4 star admiral as Commander, US Pacific Fleet in 1973. Admiral Clarey was a principal mover in bringing Bowfin to Hawaii, forming the Pacific Fleet Submarine Memorial Association and moving the Pacific Fleet Submarine Museum from the Submarine Base to Bowfin Park. His efforts are reflected in the museum structure we have today. REAR ADMIRAL Paul Lacy joined the Pacific Fleet Submarine Memorial Association as a board member during the 1980s and has served in many capacities including President. Admiral Lacy’s devotion to the submarine force is long and impressive. He was the Commanding Officer of the USS Ethan Allen (SSBN-608), which fired the only missile ever launched with a live nuclear warhead. Admiral Lacy and his late wife, Kay, began the educational endowment for the Bowfin Scholarship fund. REAR ADMIRAL John M. Barrett entered the Naval Academy in 1938 and served our nation for 39 years as an aviator and in the submarine force. 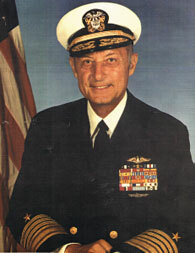 Admiral Barrett was authorized to wear both, aviator wings and submarine dolphins on his uniform. During his career, which included aviation and submarines, he was a major player in developing the successful Polaris/Poseidon/Trident submarine missile systems. 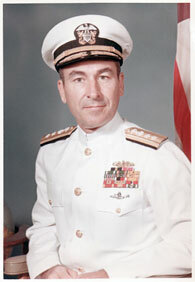 He retired as a two star admiral in 1977. He was one of the founders of the Pacific Fleet Submarine Memorial Association, and was instrumental in raising funds as well as creating the waterfront memorial. The Submarine Waterfront Memorial at Bowfin Park honors the 52 submarines and over 3,500 officers and crew lost in WWII. REAR ADMIRAL Alvey Wright is a graduate of the University of Virginia, U.S. Naval Academy, Massachusetts Institute of Technology, and Harvard Business School. During Admiral Wright’s 36 ½ years serving the Navy he was Technical Director of the Navy’s foremost ship and aeronautics research and development laboratory. Admiral Wright was a founder of the Pacific Fleet Submarine Memorial Association and the first Chairman of the Board of Directors. While serving as the Hawaii Chief of Staff for Senator Inouye, he was instrumental in obtaining USS Bowfin as a Submarine Memorial through the Navy’s Ship Donor Program. REAR ADMIRAL F.P. “Gus” Gustavson graduated from the U.S. Naval Academy in 1965. He served more than 30 years as a Naval Officer in the Submarine Force, commanding the USS Aspro (SSN-648), Submarine Squadron SIXTEEN in Holy Loch, Scotland and Submarine Group FIVE in San Diego. Ashore, he served as the Pacific Submarine Force Prospective Commanding Officer Instructor and as the Deputy Commander for the Attack Submarine Division for the Chief of Naval Operations. He served 13 years as the Chairman of the Board of Directors of the Pacific Fleet Submarine Memorial Association and was instrumental in establishing the educational endowment that will fund Bowfin Scholarships in perpetuity. CAPTAIN Francis “Bud” Cooper attended the U. S. Naval Academy, the Missouri School of Mines and Metallurgy, and the Industrial College of the Armed Forces. He served 28 years as a Naval Officer. A founder of the Pacific Fleet Submarine Memorial Association, he was the first Bowfin Park engineer. He designed the mooring arrangement and placement of the USS Bowfin in her berth. He also provided numerous innovative contributions in the formative years of Bowfin Park. CAPTAIN Alexander K. Tyree was the fourth and last wartime Commanding Officer of USS Bowfin, war patrols six through nine. Taking Bowfin into the Sea of Japan through the minefields in Tsushima Straight in June 1945, he literally finished “sweeping” the seas for the war’s end. He graduated from the Naval Academy in 1936 and was one of the youngest submarine commanders in the Navy during WWII. Captain Tyree served 30 years in the Navy before he retired and received a master’s degree in math education from Duke University. He went on to teach at Mary Washington College from 1967-1979. CaptainTyree is always remembered at Bowfin as being a strong and determined commander who served the crew of the Bowfin well. CAPTAIN Jerry Hofwolt graduated from the United States Naval Academy and served on active duty in the Submarine Force for 30 years. He commanded the fleet ballastic missile submarine USS Tecumseh (SSBN 628), Naval Submarine Base Pearl Harbor and was the first Commanding Officer of Intermediate Maintenance Facility Pearl Harbor. Following his retirement from active duty, he served for nearly 18 years as the Executive Director of the Pacific Fleet Submarine Memorial Association. He established the educational endowment that will fund Bowfin Scholarships in perpetuity. LCDR Stanley K. Nicholls was an early member of Bowfin’s Board of Directors; he exemplified “servant leadership”. As the longtime Chairman of the Boat Committee he drove a strong Bowfin restoration effort. He also was a volunteer at the Veteran’s Affairs Office in Pearl Harbor, where he helped innumerable military personnel and spouses’ transition to civilian life and especially those instances for decedent affairs. Mr. Richard DeCoster was a Bowfin crewmember aboard her last patrol and was on the crew that decommissioned her after WWII. He completed his navy career as a Ship’s Cook and then transitioned to Pan American Airlines where he completed a second career as an airline chef. He was one of many who initially volunteered to help prepare the USS Bowfin for use as a submarine museum ship and was instrumental in many decisions on her present location and condition. USS Bowfin is a Balao-class submarine constructed at Portsmouth Navy Yard in Kittery, Maine.